In 2009, I became somewhat overexcited about a new car launch. 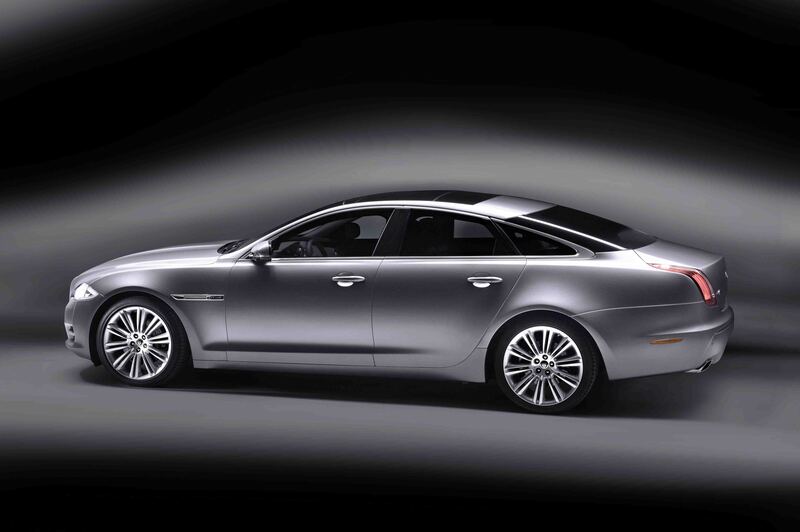 Following over 40-years of stylistic diminishing returns, to be presented with a twenty first century interpretation of the Jaguar XJ was exciting beyond rational explanation. Lacking a decent opportunity to properly appraise the car, the announcement that the chic Berkeley Hotel in Knightsbridge would play host to the car was all the catnip I required. A blustery October evening made for less than ideal circumstances, but nevertheless as I cycled from work through darkening Camden streets across London’s West End to Hyde Park Corner and Knightsbridge, I felt a sense of anticipation – trepidation even? A light drizzle began to fall. An apparition behind softly lit glass, the Jaguar hove into view in the evening gloom. Finally, the XJ in the flesh. Well almost. The view from the pavement wasn’t exactly ideal – the car positioned slightly above street level, which we know is not X351’s finest angle. Also the lighting within the showroom was decidedly on the moody side, so some of the finer points of the styling were lost – (Particularly those controversial rear quarter panels). Nevertheless, I felt I knew every curve, every crease intimately, having spent so many hours poring over disguised images, attempting to contextualise what was in the end a thoroughly unexpected styling execution. Suddenly however, peering through the glass, I had a memory, a flashback, a sense of life imitating advertising. Allow me to explain. 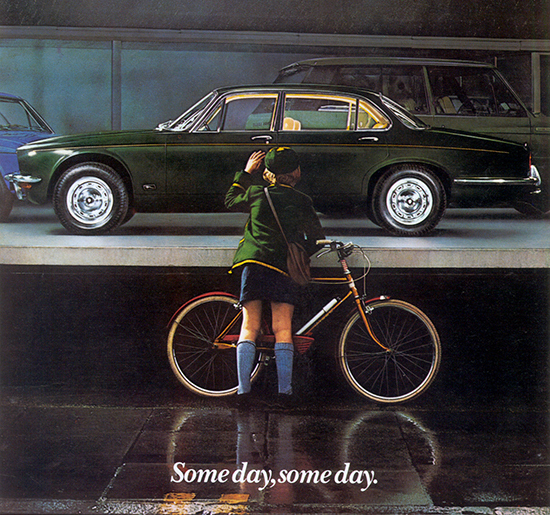 A old Jaguar print advertisement from 1978 featured a young schoolboy staring through the window of a showroom at a contemporary XJ saloon. His hand presses against the glass as he stares longingly towards the object of his desire. The tagline simply reads; “Someday, someday”. As I stood outside the window that evening, my grimy road-bike in hand, LED lights glimmering faintly, while the rain gently pattered about me and uninterested commuters trudged tubewards, I realised that after all these years I had become the middle aged version of that boy, still standing outside in the rain… I began to feel self-conscious, ever so slightly foolish. This piece dates from October 2009 and originally appeared in Car Magazine Online. A couple of years later, I stood in the same position with another ex Car writer (sadly missing from these pages!) looking at the Jaguar C-X75. I think we both also felt that same slight foolishness standing in the street, gawping upwards, so we went along to the Bristol showroom instead where we were received with surprising openness. I really think that you should present cars on the same level as your potential customers. It’s impolite to make them crick their necks. My visit to Bristol cars was similarly friendly. I’d have bought a car immediately had the cash on me that day. There’s a photo of my considerably younger self posing in front of a Rolls-Royce Corniche in 1994 (approx.) at Jack Barclay’s Berkeley Square showroom (which has since been divided into two locations). At that age, I was still wearing shorts and printed t-shirts in public, which makes said photo appear less uneasily snobbish than it would if I’d worn some part of Loro Piana’s junior couture. I’ll also never forget the Jack Barclay salesman, who responded to my mum’s enquiry about the availability of brochures with a brief ‘officially, we have none’, before returning from his office with all the R-R/Bentley literature there was. I’m still keeping each and every one of those brochures. In terms of Jaguar addresses, I’ll always treasure R. A. Creamer’s Kensington premises. It’s nothing fancy – quite the contrary, in fact -, but that only adds to its quaint charms. Whenever I’m there, I expect John Steed to turn up, asking for his Mk VII to be serviced. Albeit not strictly a spy, The Persuaders'(!) Lord Brett Sinclair was once shown having his dark yellow Aston DBS serviced at HR Owen’s. Which in effect means that even international men of mystery do need to help with maintaining their cars! I wonder why they did that. Spies are really modern culture´s equivalent of gods. They fight evil and then retire to their opulent pads to while away the time cavorting with each other. Of course, the gods do come down to earth and may act out the roles of humans. That´s probably what was behind Brett Sinclair´s visit to the car dealer. I presume the moment had some purpose greater than merely checking the right grade of oil was used. I will present this thesis more fully in “Gods, Spies and Policemen: a secular exploration of divinity and humanity” in The New Journal of Cultural Studies N. 4., Vol XVI. I´ve read two of the Len Deighton novels. They really hold up. I view them as literature that uses the motifs of the spy novel not spy novels as such. They are very clever and quite convincing. It´s Len Deighton and Harry Palmer who ought to be the face of 60s Britain rather than James Bond´s campy version. Sure Connery looked good smirking in front of that DB5 on the mountain pass and yes, I have tried to get a pair of similar trousers but it´s really Palmer who represents a more rounded idea of the buzz of the 60s. In my distant memory of Ian Fleming books, I remember Bond’s mechanic being mentioned at least once. Bearing in mind his proclivity for wrecking cars, it would have been quite a lucrative position. I used to know someone who, in the Sixties, lived in London and had his DB5 serviced by the man who serviced Peter Sellers’s constant stream of cars. This seemed very exotic to my suburban self. The Jack Barclay story is very reassuring Kris. Mark and I did tease some literature from Bristol when we visited – it wasn’t much, but at the same time it was probably all there was. Regarding the photo of you outside the JB showroom, if you are having problems uploading and displaying it, Kris, just let me know …….. In 1978 that child was about eight or nine. Chances are he´s in his middle forties and may very well be able to afford to buy a Jaguar. Is the car he is buying now in any real sense the same as the one in the window? That´s both relative to the 1978 car and in terms of Jaguar´s place in the world. If he buys a 1978 car he gets a lot of trouble for his money (not what having a nice car is all about) and if he gets a 2015 Jaguar he gets a car with zero romance, being quite frank. Next Next post: How Well is Nissan’s Pulsar Doing?